Though I’m not familiar with places here in Manila I really tried my best to find the place where Greenpeace and Solar Generation Pilipinas were based during the event. I honestly got lost along the way and was even late for the call time but managed to find Malate Church, and was able to participate in the organization’s activity and in the earth hour itself. The moment I arrived, the first thing that I noticed were the people busy doing and preparing for the event. I was also awed by the preparations made by the parish headed by Fr. John Leydon. 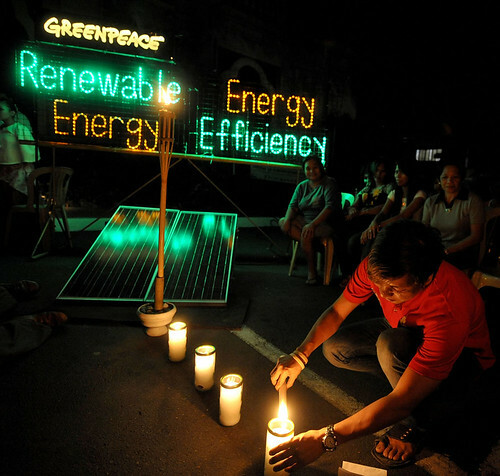 The Greenpeace organization also did their part by installing solar energy panels as demonstration that was used during the earth hour. In the event I met other Greenpeace and Solar Generation Pilipinas’ other members who were also active in making the event successful. An hour after I arrived, all of us witnessed earth hour. The lights went out at exactly 8:30 accompanied by a 2-minute quiet reflection. I think this is also one way to appease noise pollution even for just 2 minutes. It was then followed by the switching of the LED lights that read “Renewable Efficiency, Energy Efficiency” which was put up by Greenpeace and Solar Generation Pilipinas. This is to show that there’s really a solution to the problem that the planet is embracing at the moment, and it’s by changing to RE (Renewable Efficiency) at the production side, and making EE (Energy Efficiency) known at the user’s end. After the switching of the LED lights, it was then followed by the lighting of the candles and by saying prayers from chosen people in different languages. What amazed me the most was on how the parish made it possible for different cultures to become one in this event. It was heartwarming to see that a Korean, who’s having a hard time pronouncing the English language, was trying his best to read the passages assigned to him. Also, a Muslim participated by reading a passage that has something to do on how to protect our nature and on how to stop the rising climate change. This is to show that climate change is not a problem of one sector only, but of humanity. That no matter what race you are in, what language you speak and even culture you belong to, it’s a fact that we are currently in a battle we call climate change. The event continued by series of performances such as singing, dancing and drumbeating. The drumbeaters made the night for they allowed witnesses and audiences to dance the earth hour away. The night wouldn’t be as complete without the photographers and media men who covered the event. There were photographers and camera men everywhere who documented the event that happened. We are just thankful and grateful to them because they made it possible for Earth Hour to be made known nationwide. It was really a night to remember not just for me but for everyone in Malate Church who participated in the earth hour. As the lights came on, Beau, Greenpeace’s Campaigner for the event made a short talk on how and what the turning off of the lights symbolizes. She also restated in doing our best in pushing with Energy [R]Evolution as a mean in solving the planet. The night started with a prayer, so it did end in prayer. We ended it by making a big circle while holding hands and prayed a prayer of peace and of the healing of our planet. After which, Fr. John Leydon gave his closing speech that encapsulated the need to change our lifestyle in fighting climate change. He also emphasized that this problem is not for one sector to solve for alone, but it’s for everyone to take action with. All in all, the event was a success. It goes to show that although not everyone are active in saving Mother Earth, there are still people who are willing to devote themselves in acquiring changes that can make an impact not only to ordinary people and to our government officials who have the power to make changes, but most importantly to our planet. It’s not yet too late to make one. Let us start it within ourselves and show the world what a beautiful place it is to live in by saving it. Simple means create big impact. Let us save our planet, let us stop climate change.